This class can be use to display PHP execution information in the current page. The menu can open and close areas with smooth animation to show details such as the current script SERVER, REQUEST, POST, GET, COOKIE, FILES and ENV variables, included files, defined constants. and the current script source code. 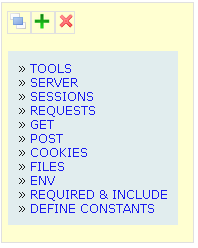 It also shows a tools menu to clear all the session, cookie and request variables. Prize: One downloadable copy of Komodo Pro Debug tools are very useful when you need to determine the cause of problems of implementation of a site. This class provides a debug tool that presents many types of relevant information in the current Web page in an easy and smooth way to navigate. COPY THE WHOLE FOLDER INTO THE JS/ DIRECTORY. the drag and drop option to drag the toolbar wherever you want. 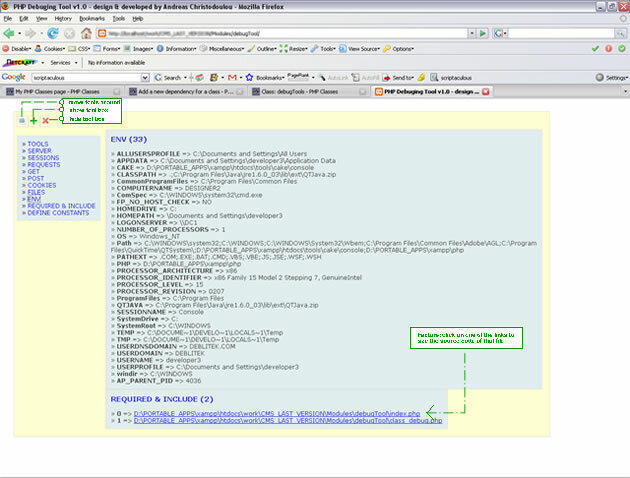 A demo for the debugTool to show the functionalities of the application.